I have this mantra that I learned years ago at a Buddhist Meditation retreat and I repeat it to myself whenever doubt or uncertainty creeps into my mind. “I am open to the perfect organizing power of nature. I accept what the universe has planned for me”. If you want, substitute God, or whomever or whatever it is that you believe, in place of nature and universe. To me, it’s all the same. And it doesn’t mean that I don’t go after what I want in life. I believe it just means that the universe is going to provide it for me when I’m truly ready to receive it and can handle it. I’ve been reciting my mantra regularly for the past two weeks because just when I thought I was settling into this life of travel on the straight open road, the road took a turn. My head was spinning. Am I in? I was flying to New Zealand in less than 24 hours, still had not researched lodging, and was meeting a friend for lunch in 2 hours. “In” also meant that I would have to cancel the rest of my non-refundable flights. I would have to reschedule the rest of my travel and probably rebook in a different order because in 3 months time, the climate of the countries I was planning to visit would be different. I would have to cut my time in New Zealand short. And, if I continued my journey in 3 months when the assignment ended, I would no longer be home before the end of 2014, so I had to think about what I had planned to take care of in the US before the year’s end… things like taxes, storage, banking, etc. So the negotiations began. Before going to lunch with my friend, I updated my resume and sent a proposal of what I needed from the company in order to be “in”. I was completely distracted during my lunch and had to apologize to my friend for being a little less present than normal. My usual 3-5 day advanced planning routine for what comes next turned in to no planning at all. I would just have to see what the world holds for me when I woke up in the morning. I did decide to get on my flight to New Zealand and I did find lodging there thanks to some lovely kiwis who kindly accepted my last minute request for a room. After some back and forth emails over the course of 48 hours, we had reached a verbal agreement on my proposal. My new manager said, “I think we’re going to have to find our feet on this one, but with a little faith from both sides of the camp, I am sure we will be fine.” Pre-travel, no way. Post-travel, I feel like I could be dropped into a war zone and find my way out of it. So, ok, faith it is. Now, at this point, my head made this decision before I consulted with my heart. My head thought, “an opportunity to work internationally”, no brainer. I needed to really let it sink in and make sure I was ok with it before I started reorganizing, so although I had the idea of renting a camper van in New Zealand when I was still in Australia, it couldn’t have become more necessary at that moment in Auckland to give me some time alone with my thoughts and my heart… some time to make sure I was “in” and could make a mental shift to jump back into work. And within another 48 hours, after a little searching, the universe provided a campervan. Now, the thing I love about road trips is that it’s just me and the road. Sure, there’s the gorgeous scenery and the fellow travelers and locals I meet along the way, but mostly there’s just lots of time for thinking, reflecting, and appreciating. I have been relishing every minute of it to ponder my tomorrows. I’m not necessarily one who will make “pro” and “con” lists. I’m more of a person who looks for signs and then goes with my gut. 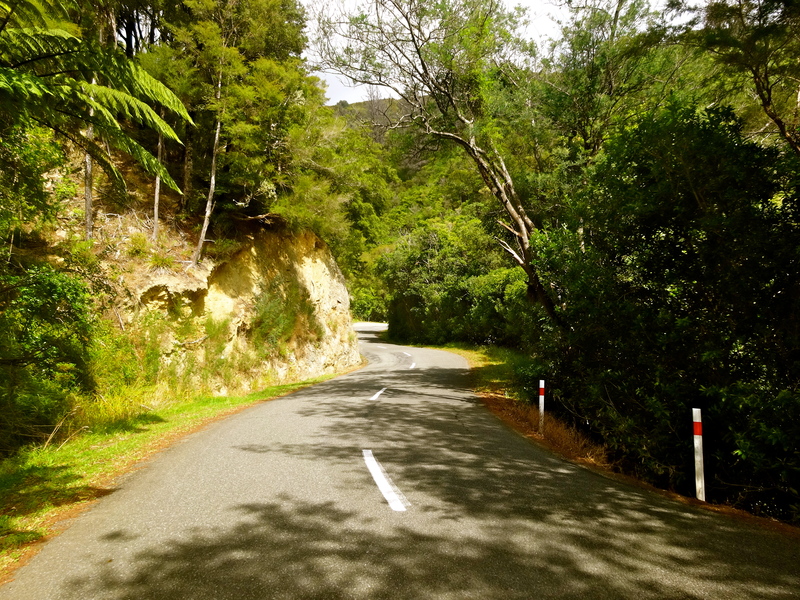 Interestingly enough, here are some of the signs that New Zealand provided to me as I literally looked at the road ahead and thought about what I should plan next. This is a road sign, but how apropos. What hazards could I expect to find upon arriving in Johannesburg? 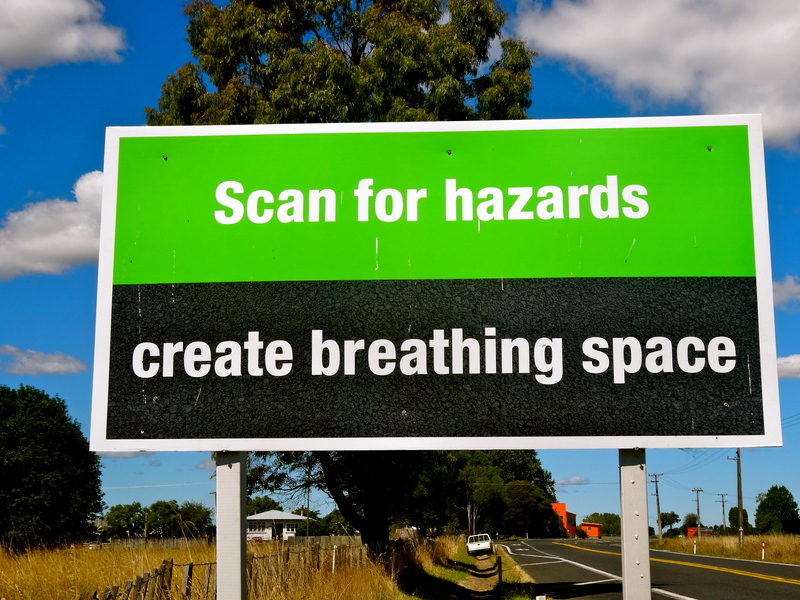 How could I create breathing space? Right. 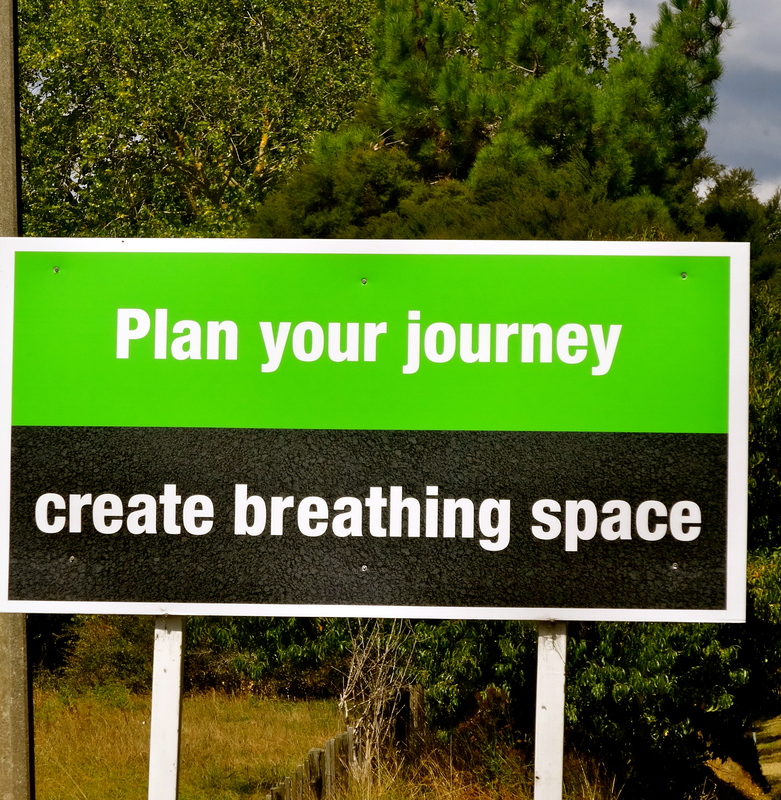 You can plan your journey, but plans don’t always work out the way you expect, so create breathing space. Wow. Too fast? Slow down. 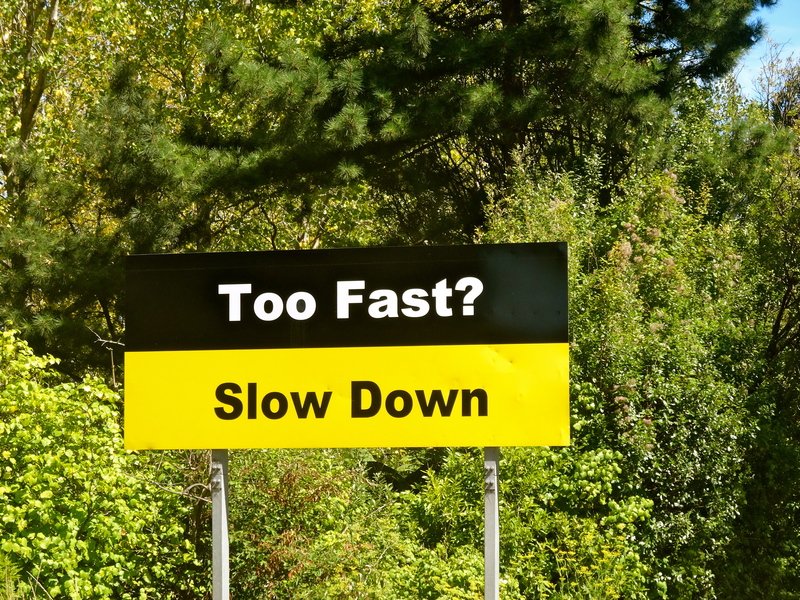 Right… slow down. Ironically, when I submitted my proposal, even before I saw these signs, I added a clause that outlined the maximum amount of hours I would be willing to work per week. I added it to put the company on notice but also to ensure that I held myself to a balanced life. It was to give myself “breathing space”, even if I wouldn’t have defined it as that at the time. I’m sitting in my camper van thinking, have these signs always been here or did someone recently just come and place them on the side of the road for me? I am loving my travels for all of the many reasons that I’ve alluded to in prior posts, but the side effect has been that I’ve also learned to breathe again, and I mean breathe deeply. Hi, my name is Katie and I’m a workaholic. Everyone who knows me or has ever worked with me knows that I often lose some of the balance in my life because I throw myself into everything I pursue with all of my heart. So, here’s my chance. I’ve dedicated this year to travel and I’ve thrown myself into it, but this might be my chance to find balance even in traveling. A little work, a little travel, a little work, a little travel. Maybe this is how my life should go. Some routine and then a break from routine. The signs are making me ask myself all the right questions. Maybe some of the lessons I’m learning have really sunk in this time. Maybe I’m ready to learn them. I’ve been on the road witnessing the amazing and breathtaking scenery of New Zealand for seven days. 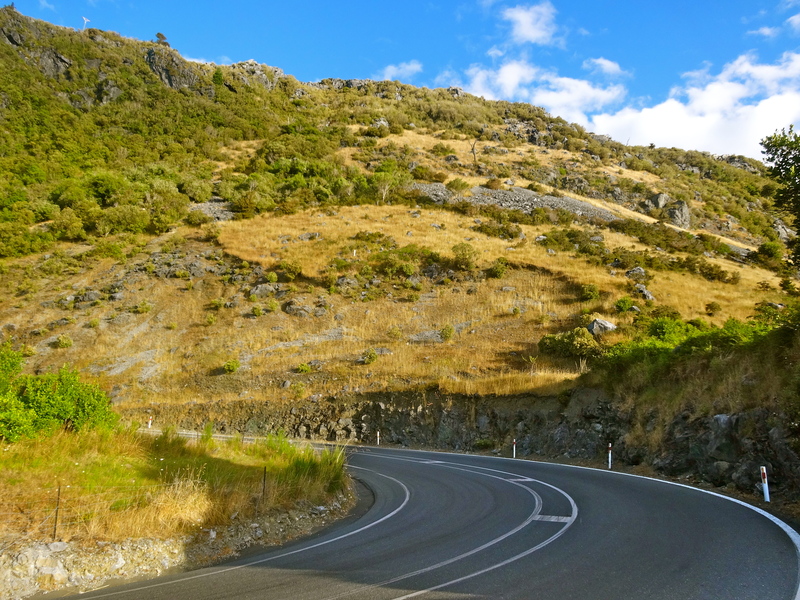 When the road takes a turn, and I can’t see what’s ahead, I hug the curve and it always straightens back out again. I’ve been breathing deeply and I’ve been revelling silently with awe and gratitude. And I’ve decided…I’m in. Thanks for letting me talk this through and share it with you. Stay tuned for more adventures as I go back to South Africa… in 4 days! Excellent job Katie and so well written except one small thing towards the end. Twice to have breath instead of breathe. Funny of all things this would be the word with a typo 🙂 just another way your body, mind and spirit are learning to process. I love you so much and am taking in all of your experiences and am loving your writing and expressing abilities. Excellent work, you are so learning a new way of adaptation to all things. I love you. I have been following all your posts and if I “read” beyond the text i really believe that in each one you share with us much more than a place´s description or a life´s experiencies. You are sharing with us a deep pursuit of the meaning of your/our life. I felt this way when i met you in Buenos Aires and then in Carmelo confirmed that feeling. I agree with you, trust in the universe, in your own hunch and go on. Nothing could go wrong because this is not an right or wrong issue. Even the bad has something good in it. We only have to look for it. Esteban and I are with you, accompanying your road through the distance. With this blog you have created a “breathing space” for all of us (old and new friends). Thank you so much. PD: Your old boss beat me by an inch because i was thinking to propose you work together (teleworking) trying to maximize our competencies. Perhaps in another moment! Rosana, thanks so much for your kind message. And yes, the pursuit is certainly what I mean to convey. I’m glad it is coming across that way. I’m sending a giant hug right back to you. PD: I thought we could work together well even when we first discussed our careers in Buenos Aires, but wasn’t sure I could be as effective as you in a Spanish speaking country:) Who knows what time will bring! Seriously Katie? I can’t believe you are going back to work but I can’t believe how all of it unfolded… watch the signs and breath… it is all meant to be this way. Good Luck! Thank you for sharing Katie! It’s another great adventure. Enjoy the ride and stay true to yourself! I know this reply is a tad late, but wanted you to know again, and in writing how awesome you are! I continue to revel in the awesomeness of KW….